Not the worst three intro rums, but hardly the best. Especially when it’s a cute blonde who’s clearly psyched for pirates. Where’s the Goslings Old, where’s the Sea Wynde??? C’mon, mate – give Alison some rum that will set her mouth on fire so she can “arrrrr” properly! This isn’t a rare rum. It isn’t expensive. Which is precisely why it deserves a glowing review. 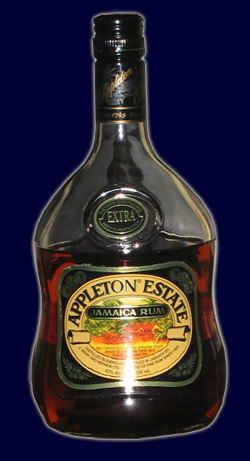 This has become my staple rum. I’m no longer a big rum & coke drinker, and many of your grocery store level “real” rums have fallen flat to me. But Appleton V/X is a fine deal – rummy but not too harsh. It gives the illusion of possessing depth while remaining shallow enough that you need not think too much. The perfect rum for a tired pirate doing late night web work or playing Yohoho! Puzzle Pirates – which is exactly what I use it for. Internet Wine and Spirits says this rum has an “unctuous big finish.” What the hell does that mean?